The Smith Tower is being sold AGAIN. After a fresh round of 2015 renovations to the observation deck (complete with a brand-new speakeasy), Unico Properties is selling. Three years was long enough, evidently. The new owner: Goldman Sachs. 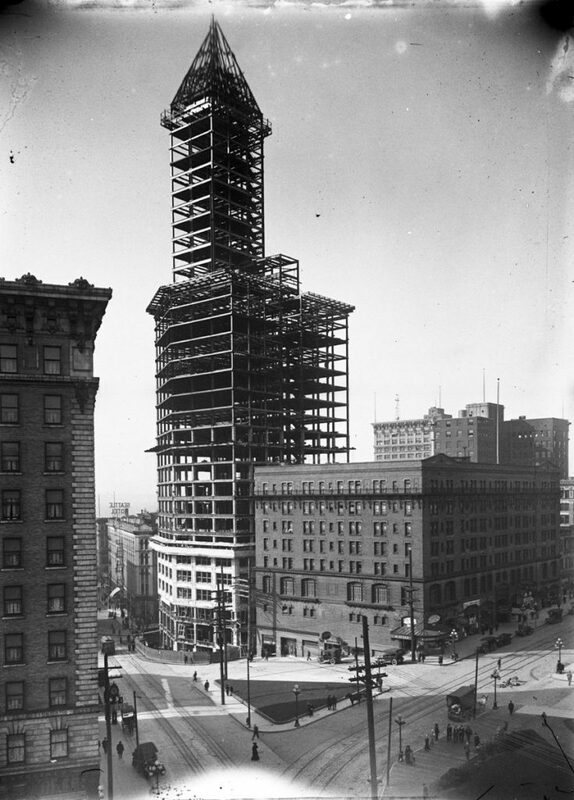 Lyman Conelius Smith, made rich by guns and typewriters, built the Smith Tower to impress. At the time, Seattle was the “fastest growing city in America,” and Smith wanted to make his mark there. He built the tallest tower west of the Mississippi, and he spared no expense in gaudiness. Onyx covered the lobby, and the gold doors were engraved with LCSmith. The most ostentatious and popular styles of the time appeared throughout the building, and the elevators used state-of-the-art technology (those original elevators are still in use today—manually operated, maintained by Otis, and designated as a historic landmark). The lavishness certainly impressed Seattle: on opening day, July 4, 1904, 4,400 visitors rode the elevators to the 35th-floor observation area (25 cents apiece) to admire never-before-seen views of Seattle, the Puget Sound, and the Cascade Mountains. Lyman Cornelius Smith wanted a legacy, and his tower made one. He was also rich enough not to care the exorbitant cost of building it. The Smith family was unable to turn a profit on the building. Burns Lyman Smith, Cornelius’s son, owned Smith Tower for just ten years. Then a series of owners rotated in and out of possession, none of them making money on the investment. 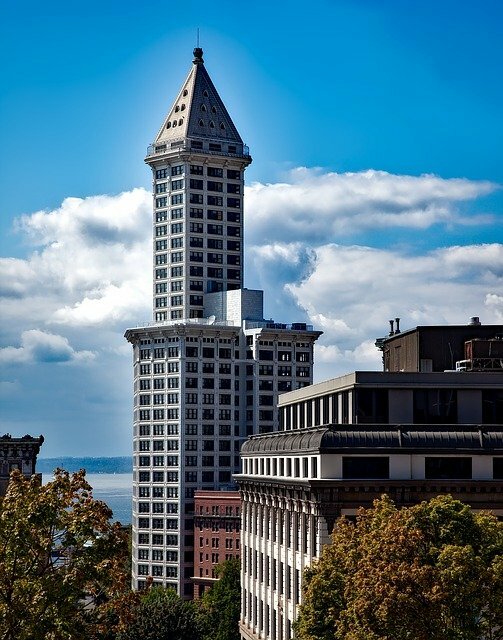 Ivar Haglund—our beloved Fish & Chips Ivar—bought the Smith Tower for $1.8 million in 1976. Almost immediately afterward, he took a trip to outfit his new tower, particularly its Chinese Room Observatory, with authentic Asian artifacts. On a less authentic whim, Ivar added a 16-foot-long windsock to the top of Smith Tower, dubbed “The Rainbow Salmon.” Fifty-plus years after its construction, Ivar Haglund was reportedly the first owner to make money on the investment. 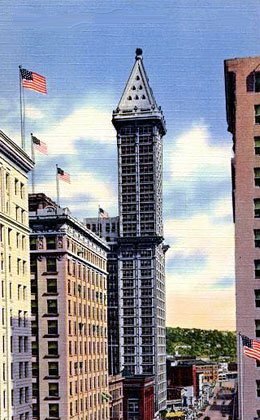 Smith Tower remained an icon on the Seattle skyline, but not a profitable one. 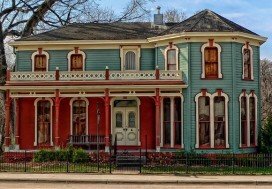 Samis Land Co. invested $27 million in fixing up the fixer-upper. Part of the renovations included converting the caretaker’s apartment inside the pyramid cap into a luxurious, two-story penthouse. That penthouse is still occupied today (and looks like THE dream home). Walton Street Capital bought Smith Tower with plans to turn it into housing space. They obtained permission for condominium conversion from office use, but then—recession. Seattle’s housing bubble popped, deafeningly so, and Walton Street Capital’s plans crumbled. In 2011, CBRE Group purchased the $42.5 million mortgage in default on the Smith Tower. At that time, the tower sat 70 percent vacant, operating costs outpaced rent income, and a King County assessment valued the property at less than half of its $42.5 million mortgage. 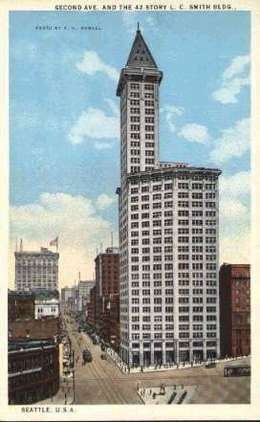 However, as Seattle recovered from the housing bubble and the city attracted more and more newcomers, Smith Tower recovered, too. After just four years, CBRE Group sold the tower for $73.7 million—almost double its original investment. CBRE Group was Smith Tower’s 20th owner. Unico Properties now owns Smith Tower. It has remodeled the public areas, and as of August 25, 2015, the Smith Tower is open for exploration. There’s a new ground-floor market, and visitors can pay $19.14 (a nod to the tower’s origin) for a self-guided tour or $10 for a historic elevator ride to the speakeasy-style bar on the observation deck. Goldman Sachs is buying the Smith Tower in a package deal—sort of a like a silent auction basket, but with skyscrapers. Goldman Sachs will pay Unico Properties $750 million for a “portfolio” of properties in Seattle and Denver. The details aren’t public, but King County assessed the Smith Tower at $113 million. Can big New York money change the trajectory of Smith Tower? Or will Goldman Sachs just be the next temporary owner in the revolving door that is Seattle’s original skyscraper? As Smith Tower demonstrates, real estate investment doesn’t always pan out. Ivar and CBRE Group made out on the tower, but no one else turned a profit on the deal. It’s a tale of caution that applies to smaller real estate investments, too—not just $131 million investments like Smith Tower. Effective real estate investing takes research, wisdom, and most importantly, experience, to navigate real estate investment successfully, and that’s where we come in. We’ll help you make a sound decision, and we’ll help you find a house that will stay in the black. Take a look around our website, hear what our past clients have to say, and give us a call!